The ancient Greeks produced an immense volume of writing recording the birth and early development of Western literature, science, drama, philosophy and other areas of human endeavor. The Homeric epics, the philosophical writings of Plato and Aristotle, Greek drama, the New Testament, the writings of the Eastern Church Fathers, and the Justinian legal corpus are only a few examples of this extraordinary heritage. Unfortunately, only a very small percentage of these texts--an estimated 3-5%--has survived. Most have been irretrievably lost due to accidental destruction, the natural devastation of time, or plundered by foreign invaders. The few texts that remain--all the more precious as representations of what has been lost--are widely scattered and can be difficult to access. For centuries, scholars have sought ways to ensure that the remaining corpus both survives and thrives. Perhaps improbably, the fledgling UCI campus began to play a central role in fulfilling this scholarly vision in 1972 when the pioneering Thesaurus Linguae Graecae® (TLG®) was founded thanks to a remarkable $1,000,000 gift from classicist and UCI alumna Marianne McDonald. The TLG's goal was to collect the entire corpus of extant Greek literature from antiquity to the present era, and to explore the advantages offered by modern technology to ensure the long-term preservation and accessibility of these valuable texts. Similar efforts had been undertaken in the past but were abandoned due to the sheer volume of material and the cumbersome methods of gathering data manually. It was the advent of modern technology and this young classicist’s vision that provided the catalyst for achieving what had previously seemed impossible. Thirty-two years after it began, the TLG has become an internationally recognized research center. Its digital library contains more than 12,000 volumes available via the Internet or on compact disk to thousands of institutions and research libraries in 57 countries around the world. Access to these materials has effected fundamental changes to the study of antiquity and has revolutionized scholarship in a variety of disciplines, including Classics, Ancient and Byzantine History, Linguistics, and Religious Studies. This exhibit first traces the transmission of Greek texts over the past 3,000 years via the array of media, from fragile papyri and stone inscriptions, to medieval manuscripts and printed books, that have been used to distribute and preserve them. Rare books from the 16th to the 21st centuries illustrate the range of printing techniques, translations, scholarly apparatus, and artistic interpretation that have been applied to ancient texts through the centuries. Classical authors whose works are represented include philosophers Plato and Aristotle, playwrights Euripides and Aristophanes, epic poet Homer, fabulist Aesop, medical writer Hippocrates, and others. Also included is a copy of the Thesaurus Graecae Linguae, the lexicon published by Henri Estienne in Geneva in 1572 that served as an inspiration for the TLG name and concept. The exhibit next explores how the TLG undertook the monumental task of creating a comprehensive digital library at a time when the necessary technologies did not exist. 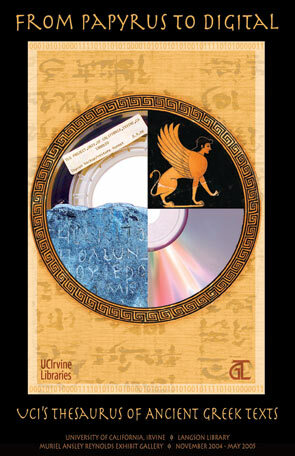 A collection of artifacts and publications illustrates the development of the TLG and its technologies, which began at the most basic level of designing the software to store, display, and print letters in the Greek alphabet. The TLG archives were recently moved to the UCI Libraries to ensure their preservation for the benefit of future scholars. The exhibit celebrates the transfer of the archives and the importance of the project to the history of UCI, the field of Classics, and the evolution of computing in the Humanities. From Papyrus to Digital was curated by Maria Pantelia, Thesaurus Linguae Graecae Director and Professor of Classics, who has published and lectured extensively on ancient Greek literature and the application of digital technologies in Humanities research and pedagogy. Most of the items exhibited are from Special Collections and Archives in the UCI Libraries, including the rare book and contemporary fine press collections, as well as the archive of the TLG Project. Several items were loaned by the Thesaurus Linguae Graecae Project, Theodore Brunner, and Jay Shanor. We are grateful for their generosity. © 2008 The Regents of the University of California. All Rights Reserved.